Aims: Though impaired cognition in Parkinson's disease (PD) is well known, data in early PD is sparse. This study was designed to assess the cognitive profile in patients with early PD (motor symptoms <5 years and Hoehn and Yahr stage <2), and to compare the cognitive profile between these patients with right versus left side onset of motor symptoms. Materials and Methods: National Institute of National Health and Neurosciences (NIMHANS) neuropsychological battery was used to assess the cognitive profile in 50 patients with early PD and compared with 50 age-, education-, and gender-matched healthy controls. Within the PD group, the cognitive profile was also compared between patients with right side onset motor symptoms (RPD) versus those with left side onset (LPD). The neuropsychological tests assessed the executive functions, memory, attention, visuospatial functions, and psychomotor speed. Results: Among the 50 patients, 25 each were RPD and LPD. The two subgroups were matched for age, gender, education, age at disease onset, disease duration, and degree of motor disability. There was no significant difference between the groups on Hoehn and Yahr staging or Unified Parkinson Disease Rating Scale (UPDRS) motor score. Patients with early PD performed significantly worse in the tasks involving memory, executive functions, and attention compared to controls. However, there was no difference in the cognitive profile between RPD and LPD subgroups. Conclusions: Patients with early PD have cognitive dysfunction with predominant involvement of frontal and temporal lobes. Side of onset of motor symptoms probably does not have significant role in future development or profile of cognitive dysfunction in PD. James Parkinson had mentioned that the intellect is preserved in Parkinson's disease (PD); however, it is now clear that cognitive impairment is common even in early PD and affects a variety of cognitive functions. Several studies have shown that cognitive dysfunction is most prominent in the domains of executive function and memory. However, involvement of visuospatial domain and attention has also been implicated. , These inconsistencies may be due to varying neuropsychological tests by different authors along with usage of different cut off points for the functional impairment. The present study was conducted to determine the cognitive profile of patients with early PD and to assess the effect of laterality of onset of motor symptoms with the cognition. This was a prospective case control study to determine the cognitive profile of patients with early PD defined as duration of motor symptoms of <5 years and Hoehn and Yahr stage of ≤2. The study was approved by the Institute's Ethics Committee and all the participants gave written informed consent before undergoing clinical evaluation. All patients were recruited from the outpatient clinic or inpatient of the Department of Neurology, National Institute of National Health and Neurosciences (NIMHANS), a tertiary care teaching hospital in Bangalore, India from October 2011 to December 2012. Formal education of >7 years. Healthy controls were age, education, and gender-matched with MMSE >24. Most of these subjects were relatives of the patients admitted in the hospital. Performance on each task was interpreted as abnormal based on the standard deviation (SD) as compared to controls. Mean minus 1.5 SD was taken as normal and patients' mean score falling below 1.5 SD of the healthy normal controls was considered as abnormal. Patients were also divided based upon their scores into more than 2 SD and 2-3 SD. Data was analyzed using Statistical Package for Social Sciences (SPSS) software version 16 and a P - value of <0.05 was taken as significant. Data was expressed using descriptive statistics such as for continuous variables, mean and standard deviation; and for categorical variables, frequency and percentage. The normality of the distribution was assessed by the skewness of the values. For analysis of continuous variables, nonparametric test (Mann-Whitney test) was employed. The analysis of categorical variables was done by Fischer's exact test as the assumption of chi-square test failed. On comparison with controls, the patients showed significantly impaired performances on the tasks of memory (story immediate and delayed recall, construction immediate and delayed recall, and word third trial and delayed recall), executive functions (verbal fluency), and attention and psychomotor speed (picture cancellation task). On further analysis of RPD and LPD versus controls it was found that the deficits in both the groups were similar as compared to controls. [Table 2] gives comparison of patients with controls. However, there were no differences in any of the neuropsychological tasks between RPD and LPD groups. With regards to the medications that could interfere in cognition testing, there were 13 (52%) patients on trihexphenidyl in the right side onset group as compared to 11 (44%) in the left sided onset group (P - value = 0.68). The mean dose in right sided onset group was 4.1 ± 1.5 mg/day and the left sided onset group was 4.4 ± 1.9 mg/day (P - value = 0.66). 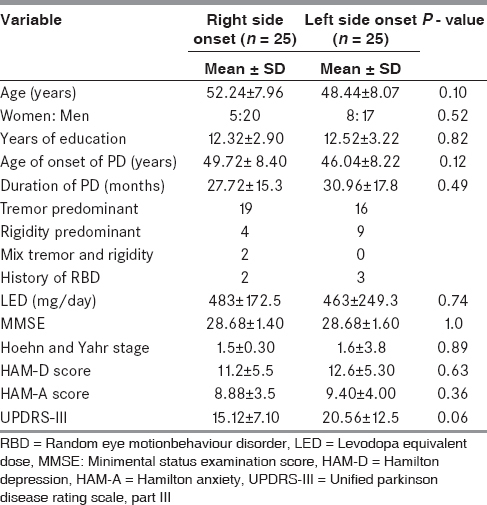 [Table 3] shows the comparative analysis of cognition in patients with RPD and LPD. The present study assessed the cognitive profile of patients with early PD and the effect of laterality of initial motor symptoms on cognition. 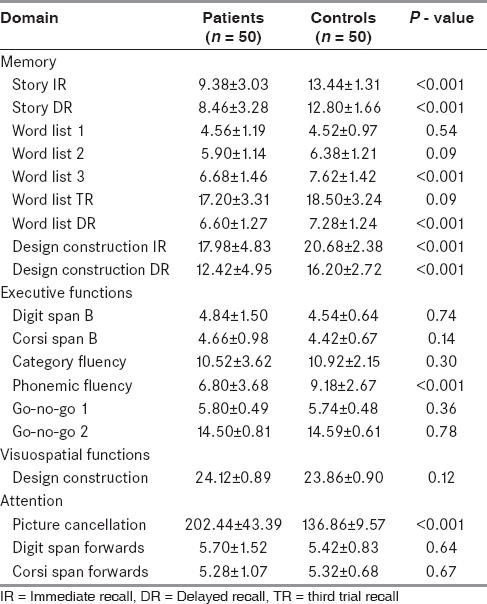 Our study found significant impairment in the tasks involving both verbal and visual learning and memory (story immediate and delayed recall, stick construction immediate and delayed recall, word list third trial and delayed recall). This was also reported earlier Weintraub et al. This finding suggests that hippocampal pathology, which in fact is common in PD may also contribute to memory impairment in a subgroup of patients with PD. , The above findings are also supported by a recent study by Yu et al., who also reported impairment of both verbal and nonverbal memory in their cohort of 94 PD patients. Thus, our study supports the concept put forward by the above mentioned study that in PD hippocampal pathology may also contribute to memory impairment apart from frontal type of memory impairment. Executive function has been often reported as the most common neuropsychological dysfunction in patients with PD. The impairment of executive functions suggest the early involvement of frontosubcortical. In our study we found a significant difference in the verbal fluency task between patients and controls which suggests involvement of the left prefrontal cortex and right cerebellum. Abnormalities of verbal fluency test is well described in PD and several studies have reported fluency deficits as predictors of future dementia. There is clearly a degree of overlap between phonemic and category fluency tasks with both relying on frontally based executive strategies. Difference in relative performance of the two tests may be useful in terms of neuroanatomical localization, given that category fluency is more commonly impaired in Alzheimer's disease and semantic dementia, while phonemic fluency impairment indicates subcortical dementias. In our study we found a significant difference only in phonemic fluency task and not on the category fluency task, thus indicating involvement of frontal subcortical component of cognition. Visuospatial impairment has been described in patients with PD, even when tests reveal few motor component involvement. , It has been suggested that such visuospatial impairment may be at least partly attributable to frontal-executive dysfunction in addition to deficit in parietal cortex. These clinical observations provide a strong support for the hypothesis that the dementia of PD has a posterior cortical basis. Although Lewy body deposition may be the most likely etiological factor, the extent to which subcortical dopaminergic and cholinergic systems influence these areas remain uncertain given that these cortical areas receive innervation from both the systems. A possible explanation why our study failed to show any significant difference in the visuospatial domains may be due to the fact that we used only one test in our battery to assess the visuospatial functions, while most other studies have included more than one test to assess the same. Dysfunction in attention is also closely related to the impairment of executive functions reported in these patients. Several studies have shown that dysfunction in attention appears most often in connection with complex tasks requiring shifting and/or sustained attention, as well as mental calculations that require sustained mental tracking. The underlying pathological substrate of this dysfunction is not yet clear, but metabolic activity and cholinergic deficits in the thalamus have been suggested as possible mechanisms. 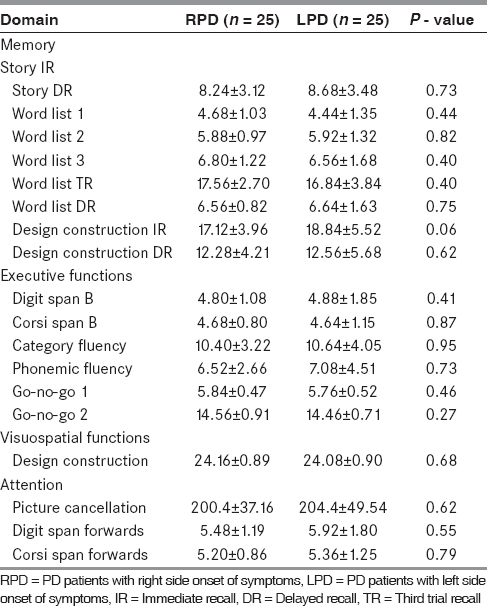 , In our study; digit span forwards, Corsi's span forwards, and picture cancellation task were used to assess attention. While there was no significant difference in the former two tasks, the later task of symbol cancellation showed a significant impairment in the performance of patients compared to controls, suggesting impairment of attention. Moreover, since the task required to cancel the objects with maximal speed, an additional impairment of psychomotor speed in these patients could be responsible. We found that neuropsychological tests can detect impairment of memory, executive functions, and attention in the early stages of PD. Though fronto-subcortical involvement is known to be the main contributor of cognitive dysfunctions in PD, the involvement of medial temporal lobe may be equally important. Neuropsychological testing detects mild cognitive changes in early PD, which is important clinically for the comprehensive management of the patients. In addition, the neuropsychological assessment can provide insight to the patients and family members for planning their future needs. Finally, our study failed to support the concept that the side of onset of motor symptoms influence cognition in early PD. These can be attributed to deficiency of tests or due to compensatory mechanisms and neural plasticity in the existing networks that neutralized any effect of pathology with respect to the laterality of symptoms on cognition. However, longitudinal studies are needed on larger cohorts to ascertain the relationship between the initial laterality of motor symptoms and cognitive function. Weintraub D, Moberg PJ, Culbertson WC, Duda JE, Stern MB. Evidence for impaired encoding and retrieval memory profiles in Parkinson disease. Cogn Behav Neurol 2004;17:195-200. Pillon B, Dubois B, Lhermitte F, Agid Y. Heterogeneity of cognitive impairment in progressive supranuclear palsy, Parkinson's disease, and Alzheimer's disease. Neurology 1986;36:1179-85. Montse A, Pere V, Carme J, Francesc V, Eduardo T. Visuospatial deficits in Parkinson's disease assessed by judgment of line orientation test: Error analyses and practice effects. J Clin Exp Neuropsychol 2001;23:592-8. Lewis SJ, Slabosz A, Robbins TW, Barker RA, Owen AM. Dopaminergic basis for deficits in working memory but not attentional set-shifting in Parkinson's disease. Neuropsychologia 2005;43:823-32. Djaldetti R, Ziv I, Melamed E. The mystery of motor asymmetry in Parkinson's disease. Lancet Neurol 2006;5:796-802. Barber J, Tomer R, Sroka H, Myslobodsky MS. Does unilateral dopamine deficit contribute to depression? Psychiatry Res 1985;15:17-24. Blonder LX, Gur RE, Gur RC, Saykin AJ, Hurtig HI. Neuropsychological functioning in hemiparkinsonism. Brain Cogn 1989;9:244-57. Yu RL, Wu RM, Tai CH, Lin CH, Cheng TW, Hua MS. Neuropsychological profile in patients with early stage of Parkinson's disease in Taiwan. Parkinsonism Relat Disord 2012;18:1067-72. Erro R, Santangelo G, Picillo M, Vitale C, Amboni M, Longo K, et al. Side of onset does not influence cognition in newly diagnosed untreated Parkinson's disease patients. Parkinsonism Relat Disord 2013;19:256-9. Movement Disorder Society Task Force on Rating Scales for Parkinson's Disease. The Unified Parkinson's Disease Rating Scale (UPDRS): Status and recommendations. Mov Disord 2003;18:738-50. Williams SM. Factor analysis of the Edinburgh handedness inventory. Cortex 1986;22:325-6. Tripathi R, Kumar JK, Bharath S, Marimuthu P, Varghese M. Clinical validity of NIMHANS neuropsychological battery for elderly: A preliminary report. Indian J Psychiatry 2013;55:279-82. Eggers C, Kahraman D, Fink GR, Schmidt M, Timmermann L. Akinetic-rigid and tremor-dominant Parkinson's disease patients show different patterns of FP-CIT single photon emission computed tomography. Mov Disord 2011;26:416-23. Junque C, Ramirez-Ruiz B, Tolosa E, Summerfield C, Marti MJ, Pastor P, et al. Amygdalar and hippocampal MRI volumetric reductions in Parkinson's disease with dementia. Mov Disord 2005;20:540-4. Alexander GE, DeLong MR, Strick PL. Parallel organization of functionally segregated circuits linking basal ganglia and cortex. Annu Rev Neurosci 1986;9:357-81. Schlosser R, Hutchinson M, Joseffer S, Rusinek H, Saarimaki A, Stevenson J, et al. Functional magnetic resonance imaging of human brain activity in a verbal fluency task. J Neurol Neurosurg Psychiatry 1998;64:492-8. Henry JD, Crawford JR. A meta-analytic review of verbal fluency performance following focal cortical lesions. Neuropsychology 2004;18:284-95. Hodges JR, Patterson K, Oxbury S, Funnell E. Semantic dementia. Progressive fluent aphasia with temporal lobe atrophy. Brain 1992;115:1783-806. Hovestadt A, de Jong GJ, Meerwaldt JD. Spatial disorientation as an early symptom of Parkinson's disease. Neurology 1987;37:485-7. Berger B, Gaspar P, Verney C. Dopaminergic innervation of the cerebral cortex: Unexpected differences between rodents and primates. Trends Neurosci 1991;14:21-7. O'Brien JT, Firbank MJ, Mosimann UP, Burn DJ, McKeith IG. Change in perfusion, hallucinations and fluctuations in consciousness in dementia with Lewy bodies. Psychiatry Res 2005;139:79-88. Ziabreva I, Ballard CG, Aarsland D, Larsen JP, McKeith IG, Perry RH, et al. Lewy body disease: Thalamic cholinergic activity related to dementia and parkinsonism. Neurobiol Aging 2006;27:433-8. St Clair J, Borod JC, Sliwinski M, Cote LJ, Stern Y. Cognitive and affective functioning in Parkinson's disease patients with lateralized motor signs. J Clin Exp Neuropsychol 1998;20:320-7. Huber SJ, Miller H, Bohaska L, Christy JA, Bornstein RA. Asymmetrical cognitive differences associated with hemiparkinsonism. Arch Clin Neuropsychol 1992;7:471-80. Bowen FP, Hoehn MM, Yahr MD. Parkinsonism: Alterations in spatial orientation as determined by a route-walking test. Neuropsychologia 1972;10:355-61. Cubo E, Martin PM, Martin-Gonzalez JA, Rodriguez-Blazquez C, Kulisevsky J. ELEP Group Members. Motor laterality asymmetry and nonmotor symptoms in Parkinson's disease. Mov Disord 2010;25:70-5. Tomer R, Levin BE, Weiner WJ. Side of onset of motor symptoms influences cognition in Parkinson's disease. Ann Neurol 1993;34:579-84. Starkstein S, Leiguarda R, Gershanik O, Berthier M. Neuropsychological disturbances in hemiparkinson's disease. Neurology 1987;37:1762-4.